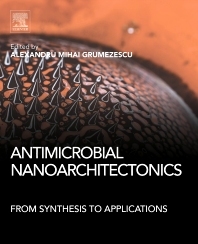 Antimicrobial Nanoarchitectonics: From Synthesis to Applications brings together recent research in antimicrobial nanoparticles, specifically in the sustained and controlled delivery of antimicrobials. Particular attention is given to i) reducing the side effects of antibiotics, ii) increasing the pharmacological effect, and iii) improving aqueous solubility and chemical stability of different antimicrobials. In addition, antimicrobial nanoparticles in drug delivery are discussed extensively. The book also evaluates the pros and cons of using nanostructured biomaterials in the prevention and eradication of infections. It is an important reference resource for materials scientists and bioengineers who want to learn how nanomaterials are used in antimicrobial therapy.